There’s a new concealer on the BEAUTY BAY block, and it’s kind of a big deal… In fact, we predict a sell-out. 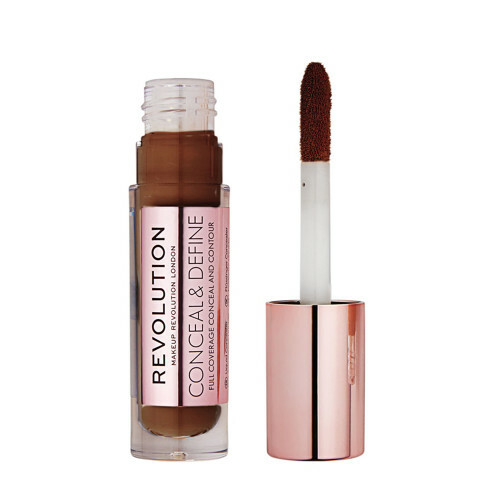 Makeup Revolution’s Conceal & Define Concealer first launched back in January and almost immediately went viral, swopping up a record number of hyped reviews from customers and beauty vloggers alike. For months it was impossible to get hold of, and currently one is sold every five seconds around the world. The reason for the hype? Not only is this concealer just £4(!) but the formula is majorly wearable. It’s long-lasting and full coverage (so completely masks dark circles and blemishes), but feels completely weightless and gives skin a fresh, demi-matte glow. Plus, it doesn’t melt, crease, cake, cling to dry patches, or settle into fine lines. It gets better – the concealer is available in an impressive 25 shades to fit every skin tone, from a pure white through to a warm dark brown. Finally it’s possible to find your perfect match, no matter what your skin colour or undertone. To apply, dot the concealer on areas that need coverage using the applicator, then blend foundation on top with a sponge – the coverage so opaque that even the most obvious discolouration and breakouts won’t need another layer. What’s more, because it has such a fluid texture, it’s also possible to use it for contouring – if a matte, sculpted effect is your kinda thing.